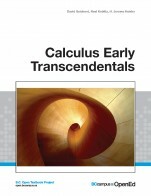 This collection contains the California Open Educational Resources Council (CA OER) list of peer-reviewed textbooks for Single Variable Calculus I Early Transcendentals (common course-id MATH 210), one of the top 50 college courses identified for inclusion in the California Open Online Library for Education (COOLforEd). A first course in differential and integral calculus of a single variable: functions; limits and continuity; techniques and applications of differentiation and integration; Fundamental Theorem of Calculus. Primarily for Science, Technology, Engineering & Math Majors. Prerequisites: Pre-calculus, or college algebra and trigonometry, or equivalent. Apply integration to find area. projects where students demonstrate their mastery of the learning objectives and their ability to devise, organize and present complete solutions to problems. The discussions and explanations are succinct and to the point, in a way that pleases mathematicians who do not like calculus books to go on and on. There are eleven chapters beginning with analytic geometry and ending with sequences and series. The book covers the standard material in a one variable calculus course for science and engineering. The size of the book is such that an instructor does not have to skip sections in order to fit the material into the typical course schedule. There are sufficiently many exercises at the end of each section, but not as many as the much bigger commercial texts. Some students and instructors may want to use something like a Schaum outline for additional problems. Published in 1991 and still in print from Wellesley-Cambridge Press, the book is a useful resource for educators and self-learners alike. It is well organized, covers single variable and multivariable calculus in depth, and is rich with applications. There is also an online Instructor Manual and a student Study Guide. This open textbook is a first and friendly introduction to calculus, suitable for someone who has never seen the subject before, or for someone who has seen some calculus but wants to review the concepts and practice applying those concepts to solve problems. One learns calculus by doing calculus, and so this course is based around doing practice problems. While each author of a calculus textbook certainly offers her own creative perspective on the subject, it is hardly the case that many of the ideas she presents are new. Indeed, the mathematics community broadly agrees on what the main ideas of calculus are, as well as their justification and their importance; the core parts of nearly all calculus textbooks are very similar. As such, it is our opinion that in the 21st century – an age where the internet permits seamless and immediate transmission of information – no one should be required to purchase a calculus text to read, to use for a class, or to find a coherent collection of problems to solve. Calculus belongs to humankind, not any individual author or publishing company. Thus, a main purpose of this work is to present a new calculus text that is free. In addition, instructors who are looking for a calculus text should have the opportunity to download the source files and make modifications that they see fit; thus this text is opensource.